Continuing my post-Comic-Con posts, here's the second of six Two-Minute Interviews I did. Today's subject is cartoonist Dave Roman, husband of cartoonist Raina Telgemeier. I don't know how two full-time comics makers manage to feed themselves, but somehow they not only survive but thrive. 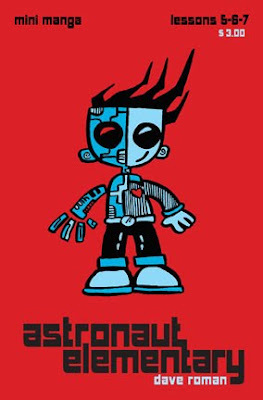 As noted in the interview, Dave is the creator or co-creator of Astronaut Elementary, Agnes Quill (a well-received book whose movie rights were optioned by Paramount), Jax Epoch and the Quicken Forbidden, Boat Boy, and the manga-style X-Men: Misfits book. Dave was also an editor for Nickelodeon Magazine until Nickelodeon foolishly decided it didn't need a magazine anymore. I met Dave and Raina at my first Eisner Awards in 2006 and I've happily followed their success from afar. Many thanks to Dave for his time (which I took much more of than two minutes). I bet you'll never guess who I interviewed next. She's (oops, a clue!) up tomorrow. He's got good perspective. You really can't write genre fiction unless you genuinely like it -- spy novels, romances, mysteries, historical fiction have to come from people who are fans at heart or they don't ring true. Unfortunately, kid lit is one area that a lot of people think they can write, but their view of kids is distant, stereotyped and condescending and it shows in their work. The problem with that is that there's so much of that stuff out there that kids have come to accept that this is what their books are supposed to feel like -- which is why Harry Potter was such a thunderbolt, because Rowling genuinely writes for kids and so her work rings true. Haven't seen his stuff, but trusting your taste and hearing his thoughts makes me think it's probably pretty authentic.